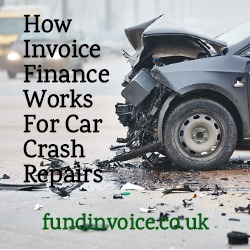 Increasingly we have seen car repair body shops turning to invoice finance to fund their crash repair invoices. We have literally just been contacted by another small garage turning over £100K per annum, trading with a small number of insurance company debtors with a handful of invoices they want to be funded against. This is type of funding is very straightforward to arrange, such that it can be completed within a day, if required. This type of funding facility is very flexible. There are no minimum size limits with this type of product, it is selective invoice finance, so you can choose to get funding against a single invoice if you wish. In most cases, our clients use the funding against all of their invoices, as that cash flow allows them to fund growth in their turnover. We can also watch their turnover grow as a result of the liquidity that these facilities inject into their businesses. The process to set up a facility is very straightforward, so much so that we have been able to arrange funding to be received by the client within 7 hours of having received first contact from a client. That speed of turnaround is often not possible with other forms of business finance. Normally there is not this degree of urgency, so typically funding can be comfortably arranged within a few days - but it's nice to know that it can be put in place very rapidly, when required. We have completed a number of these types of facility so we can offer some expertise to our clients. The speed of the sales process is helped by not having to take a debenture over the company, and not having to take a personal guarantee from the Directors or prime movers of your business. The process of funding invoices is similarly straightforward. This post sets out exactly how invoice finance works (and an indication of the costs), and the steps involved: How Body Shop Invoice Finance Works. Case study 1 - Body Shop Funding For A £300K Turnover Company.